When Jesus called Matthew to be one of the twelve disciples, he was really stretching the good will of the other eleven. 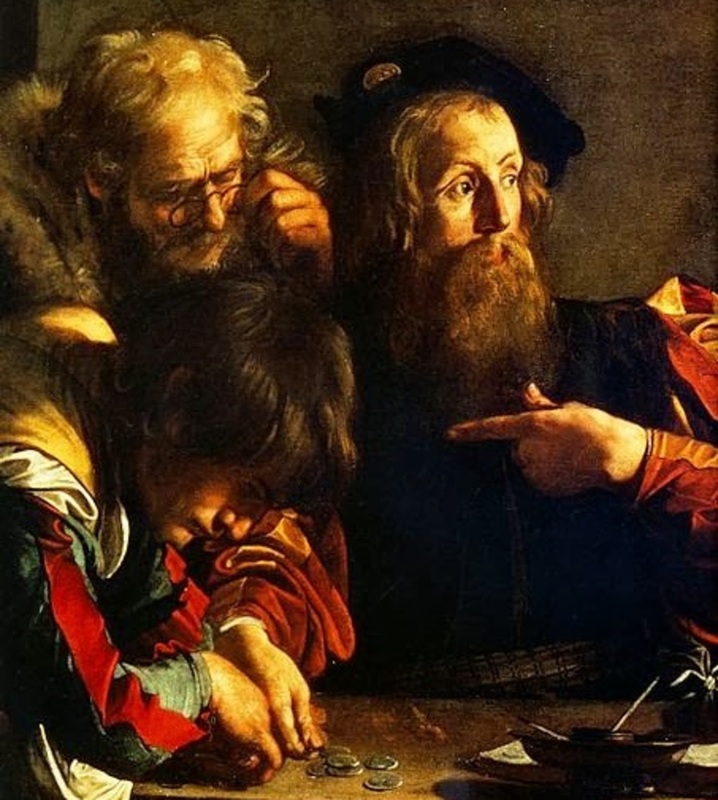 Matthew was a tax collector, which meant that he took advantage of his own people in order to line his pockets. And worse yet, Matthew was one of the tax collectors who set up on the docks and taxed the fishermen who were coming in from fishing all night. Since most of Jesus' followers were fisherman, they probably already knew and couldn't stand Matthew. But Jesus called Matthew to follow him, and it says in the text that Matthew simply got up and followed. He left behind his booth, his livelihood, and his old life, and embraced a new way of living and a new set of traveling companions. That text tells me that Matthew must have been longing for that moment deep inside his very soul. I imagine when Jesus gaze fell on him and their eyes met, that Matthew must have felt something stir within him. And I am sure he was also filled with doubts, even if it was only for a moment. Look closely at the painting. 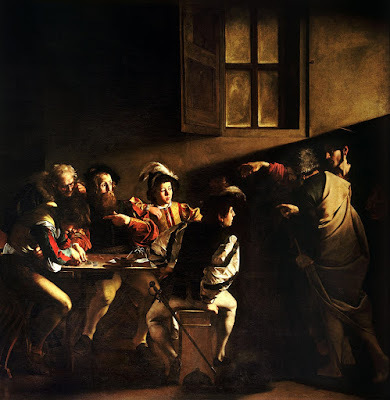 You can see Jesus' finger pointing at Matthew, calling him to follow. Now look at Matthew, sitting at the table. He's pointing to himself, seemingly asking "Who, me?" I think that most of probably feel that same way when we feel as though we are being called by Jesus to step out of our old life and into a new one. We probably question his judgment. We wonder what in the world he could be thinking. May you, in that moment of doubt over Jesus' calling on your life, be filled with the Spirit of the Lord who brings you the kind of courage that filled Matthew on that day that changed his life.